Now soon in march or April google will introduce its new tablet of worth 200$. It’s 7 inch entertainment tool, and its too smaller than the ipad 2 which size is 9.7 inch. This touch screen tablet supports Android. Google updates it’s “webstore” of music, books, films,etc before introducing its new Tablet. According to the news of Digi Time Journal that google soons markets it tablet and its price will be similar to KINDLE Fire. And it is suppose to be best for entertainment purpose, but its not the alternative of laptop but Apple’s iPad of 9.7 inch and Samsung 10.1 inch Galaxy are supposed to be alternative of laptop. 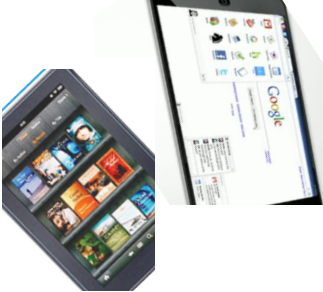 Google recently starts online sales of music, films and books, And you have easily access to these from this tablet. And its means that google competition is not with apple, it was with KINDLE fire Tablet of Amazon. And there was a news that it was more Tech than KINDLE fire and easy to use. And it is to be expected that this year Apple also introduce its iPad 3 which it too much Hi-Tech. And its resolution is too much great as Retina Display in iPhone. And its processor power is similar to a laptop one. And it is a fact that google whatever technology is used by google computer, it always needs hard work to come in competition with iPad 3, because in iPad 3 resolution is 4 times better than its currently one model.